A group of professionals and friends in the UK lead by Mr. Jayantha Herath and Nimal Rodrigo, made an organised donation worth of Rs.563,308.00, to Ranaviru Sevana, Ragama on Tuesday, 24th March 2009. This donation was made up with 38 Wheel Chairs, 31 Pairs of Elbow Crutches and some other urgent needs for the use of disabled war heroes. This donation was organised just in one week, with the help of close friends. An Egyptian national, a Hungarian national and also a Tamil family have joined the donation by presenting wheel chairs. The other most important thing was the participants were not the donors, but their relatives in Sri Lanka. The ceremony was held at Ranaviru Sevana with Brig. Sriyani Warusawitharana attended as the chief guest. Many disabled war heroes attended the function and the event was made colourful and joyous with added music by Ranaviru Band. At the end of the donation, the relatives of donors were accompanied by officers to the wards, and gift parcels were presented to the warded war heroes. Sri Lankans living in Canada have donated rupees 3 million to the Api Wenuwn Api fund maintained by the Ministry of Defence. Sri Lanka's Consular General in Toronto, Bandula Jayasekara handed over the cheque to His Excellency Mahinda Rajapaksa, President of Sri Lanka, at the Temple Trees today (Apr 1). The Sri Lankan expatriates in living in the Greater Toronto area, have made the donation to show their gratitude to the Armed Forces fighting to rid their motherland of terrorism. Sri Lankan staffers of the Intercontinental Hotel in Dubai have made a cash donation through the 'Helabima Organisation', facilitating welfare of disabled war heroes at the Ragama Rana Viru Sevana on March 26th. The cash cheque worth of Rs. 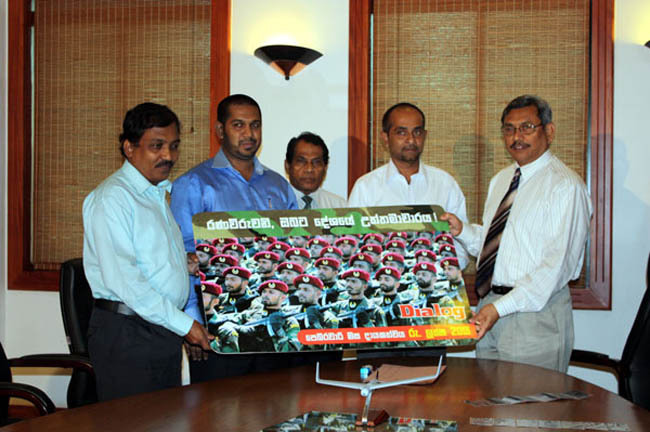 179,801 was handed over to the Adjutant General of Army Headquarters, Maj. Gen Jayantha Perera by Ven. Bengamuwe Nalaka Thero, the current advisor to the Helabima Organisation. Mr. K.T.D Jayarathne, Managing Director of Majesty Natural Food and Chemicals (Export) Ltd, Dompe made a donation worth of Rs. 2,500,000 to the 'Api Wenuwen Api' fund on March 20th Friday. 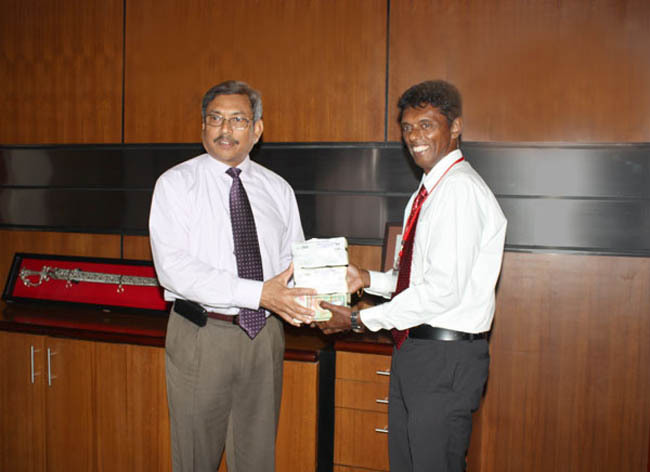 The donation was received by Secretary Defence Mr. Gotabaya Rajapaksa at the Ministry of Defence premises. Senior journalist and defence columnist of 'Lankadeepa' Mr. Duminda Sanjeewa Balasooriya was also present at the occasion. The 'Api Wenuwen Api' fund was established under the directives of Secretary Defence Mr. Gotabaya Rajapaksa for facilitating the mega housing project of 50,000 housing units for security forces personnel. A donation worth of Rs. 283,491 was made to the Ministry of Defence 'Api Wenuwen Api' fund for the welfare of security forces personnel by Sri Lankan employees of the 'Jumirah International Company Ltd, based in Dubai. The cash cheque was handed over to Secretary Defence Mr. Gotabaya Rajapaksa by Mr. Salitha Priyanga, representing employees of Jumirah International. Officially launched on 6 May 2008 at the Sri Lankan High Commission, the campaign raised £94,108 net profit in less than five months under the guidance of Brigadier Prasad Samarasinghe and with the support of Sri Lankans living in the UK. Even until March 2009 donations were still being received from our ever-supportive countrymen. On 15 March a dinner, organised by the Api wenuwen Api UK committee, was held at the Prince of Ceylon restaurant where Brigadier Prasad Samarasinghe handed a cheque for £6,794 to H.E. High Commissioner Justice Nihal Jayasinghe bringing the grand total of funds raised to over £100,000. Dinner guests were entertained by live music from the Sky High band. Mr Nalin Perera hosted the event and Mr Chanaka Dissanayake gave a speech of appreciation to Brig. Samarasinghe. H.E. the High Commissioner praised Brig Samarasinghe's dedication to the Api wenuwen Api campaign while expertly managing his schedule as a defence adviser. He invited all Sri Lankans willing to support similar worthy causes to get in touch with the High Commission and emphasised the High Commissions willingness to work closely with them. Brig. Samarasinghe gave special thanks to all individuals and organisations for their contribution and support to the Api wenuwen Api UK campaign. He further thanked H.E President Mahinda Rajapakse, H.E. High Commissioner Nihal Jayasinghe, Defence Secretary Gotabaya Rajapakse, Army, Navy and Air Force commanders for their commitment and support. Brig Prasad Requested all Sri Lankans to be united and encouraged them to work closely with the High Commission on future campaigns. H.E. the High Commissioner presented Brig. Samarasinghe tokens of appreciation on behalf of the Api wenuwen Api UK committee for his dedicated service as the defence adviser in the UK. Sky High band also presented a gift in appreciation of his valuable service to the Sri Lankans in UK and our Motherland. A donation worth of Rs. 200,000 was made for the 'Api Wenuwen Api' fund by Mr. Shantha Wickramasinghe at the Ministry of Defence today (March 12). Mr. Wickramasighe a resident at Horton Place, Colombo made the donation as a mark of gratitude for the Sri Lankan security forces, who are engaged in an untiring effort to free the island from the scourge of terrorism. 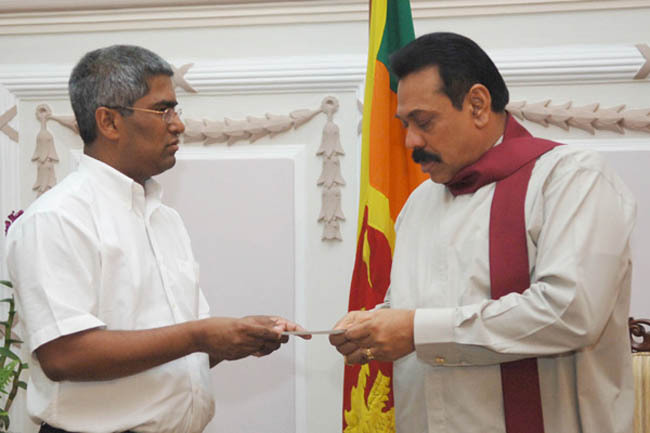 The cash cheque was received by Secretary Defence Mr. Gotabaya Rajapaksa. The 'Api Wenuwen Api' fund was established by Ministry of Defence in cooperation with the Central Bank of Sri Lanka for the construction of 50,000 houses for armed forces personnel. Sri Lanka Telecom donated over Rs 300,000 to the 'Api Wenuwen Api' fund: contributions made by its employees for the construction of houses for security forces personnel. 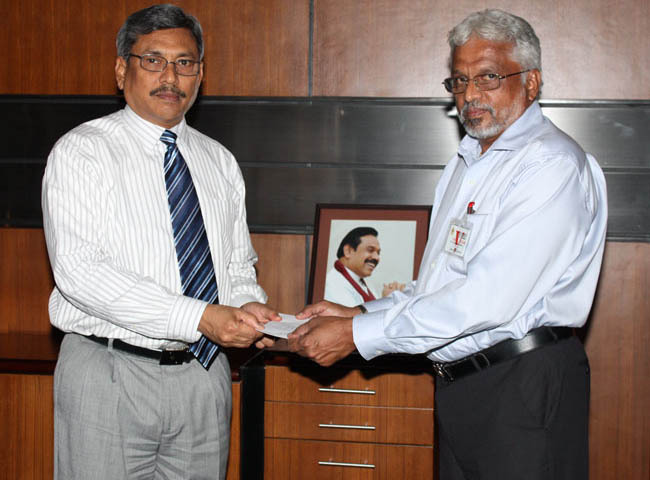 The donation was handed over to Secretary Defence Mr. Gotabaya Rajapaksa made on Monday (March 9) during a charm event held at the ministry premises. The fund was raised by employees from the Sri Lanka Telecom Man Power Solutions Department, Customer Care & Field Offices and Call centers. Mrs. PIR Panawala, Ms. WAES De Silva, Mrs. RR Perera, Mr. DSWJ Danthasingha, Mr. Ranjith G Rubasinghe, Ms. ACJ Asuramana, Mr. MKCP Mudunkotuwa and Mr. MS Mangala also participated at the event representing Sri Lanka Telecom. Many soldiers have sacrificed their lives and limbs to protect the motherland in the Elam war. The Seva Vanitha Unit of the Defence Ministry strives to up lift the living conditions of these brave war heroes. A new house was donated to Sagara Silva who was disabled during the war, by the Chairperson of the Seva Vanitha Unit Mrs. Ioma Rajapaksa on 9th March. Sagara Silva a resident of Kudavaskaduwa was born on the 29th of March 1981 to Mrs. Seelavathi Silva and Mr. Somadasa Silva at the Nagoda Government Hospital. He completed his primary education up to Grade 10 at the Deldoowa Primary School and was the third in the family. After finishing his school education he decided to join the Sri Lanka Army and accordingly on the 21st of February 2001 he joined the Sri Lanka Army Vijayabahu Infantry Regiment. Afterwards he was stationed in Muhamalai, Poonani, Trincomalee, Mannar and Adampan areas during his tenure. He was wounded at Adampan area on the 07th of March 2008 when anti-personnel mine exploded unfortunately. This brave soldier has lost both legs and is only 27 years of age. He married around 4 years ago and is a proud father of a ten month old infant. As this brave soldier had no home or land to his name a donation of a house with all modern facilities in Navagamuwa area was made under the patronage of the Chairperson of the Ministry of Defence Seva Vanitha Unit. Chairman of the National Lotteries Board Mr. Upali Liyanage, General Manager Mr. Jayasinghe, Regiment Commander of the Vijayabahu Infantry Regiment Major General G.P.R De Silva, Director of the Army Additional Welfare Director Board Brigadier R.V Samarathunga, Additional Secretary (Adminstration) of the Ministry of Defence Mrs. Indu Rathnayake and members of the Seva Vanitha Unit were present at the occasion. Dialog Telecom Ltd donated a sum of Rs. 2million to the 'Api Wenuwen Api' fund for the welfare of war heroes on March 9, at the Ministry of Defence premises. The cash cheque was handed over to Secretary Defence Mr. Gotabaya Rajapaksa by the Chairman of Dialog Telecom Dr. Hans Wijesooriya officially. Recently, Dialog telecom launched a special recharged card worth of Rs. 400 in which Rs.100 was credited to a special fund for the welfare of war heroes with every individual sale made during the month of February. Mr. Naushad Perera and Mr. Pradeep Kirthirathna represented the Dialog Company while Mr. Thivanka Jayakodi, Mr.M.M. Mohamad Isar and Mr. J.G.E Gunesekara represented the Dialog Recharge card distributors at the event.